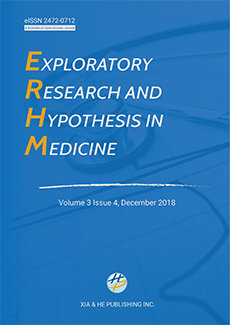 Exploratory Research and Hypothesis in Medicine (ERHM) publishes original exploratory research articles and state-of-the-art reviews that focus on novel findings and the most recent scientific advances that support new hypotheses in medicine. The journal accepts a wide range of topics, including innovative diagnostic and therapeutic modalities as well as insightful theories related to the practice of medicine. The exploratory research published in ERHM does not necessarily need to be comprehensive and conclusive, but the study design must be solid, the methodologies must be reliable, the results must be true, and the hypothesis must be rational and justifiable with evidence.